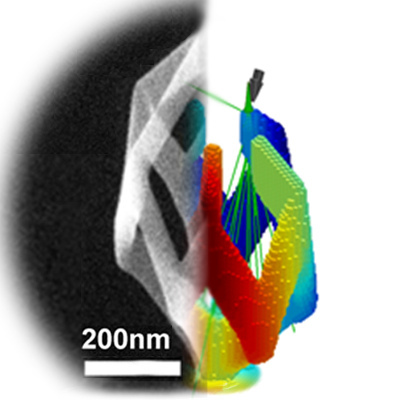 In a review paper published in ACS Nano ("Directing Matter: Towards Atomic Scale 3D Nanofabrication"), Olga Ovchinnikova and colleagues provide an overview of existing paths to 3-D materials, but the ultimate goal is to create and customize material at the atomic scale. Material would be assembled atom by atom, much like children can use Legos to build a car or castle brick by brick. This concept, known as directed matter, could lead to virtually perfect materials and products because many limitations of conventional manufacturing techniques would be eliminated. The paper is titled “Directing Matter: Towards Atomic Scale 3D Nanofabrication.” Co-authors are Alex Belianinov, Jason Fowlkes, Andrew Lupini, Philip Rack, Raymond Unocic, Bobby Sumpter, Sergei Kalinin and Albina Borisevich. This work is funded by DOE’s Office of Basic Energy Sciences and the Laboratory Directed Research Development program. Some of the work was performed at the Center for Nanophase Materials Sciences, an Office of Science User Facility and coordinated through the ORNL Institute for Functional Imaging of Materials.